Air pollution could be causing double the number of excess deaths a year in Europe than has been estimated previously, according to a study published in the European Heart Journal . Using a new method of modelling the effects of various sources of outdoor air pollution on death rates, the researchers found that it caused an estimated 790,000 extra deaths in the whole of Europe in 2015 and 659,000 deaths in the 28 Member States of the European Union (EU-28). Of these deaths, between 40-80% were due to cardiovascular diseases (CVD), such as heart attacks and stroke. Air pollution caused twice as many deaths from CVD as from respiratory diseases. The researchers found that air pollution caused an estimated 8.8 million extra deaths globally rather than the previously estimated 4.5 million. Co-author of the study, Professor Thomas Münzel, of the Department of Cardiology of the University Medical Centre Mainz in Mainz, Germany, said: "To put this into perspective, this means that air pollution causes more extra deaths a year than tobacco smoking, which the World Health Organization estimates was responsible for an extra 7.2 million deaths in 2015. Smoking is avoidable but air pollution is not. "The number of deaths from cardiovascular disease that can be attributed to air pollution is much higher than expected. In Europe alone, the excess number of deaths is nearly 800,000 a year and each of these deaths represents an average reduction in life expectancy of more than two years." The researchers used exposure data from a model that simulates atmospheric chemical processes and the way they interact with land, sea and chemicals emitted from natural and man-made sources such as energy generation, industry, traffic and agriculture. They applied these to a new model of global exposure and death rates  and to data from the WHO, which included information on population density, geographical locations, ages, risk factors for several diseases and causes of death. Worldwide, they found that air pollution is responsible for 120 extra deaths per year per 100,000 of the population. In Europe and the EU-28, it was even higher, causing 133 and 129 extra deaths a year per 100,000 people, respectively. When they looked at individual countries, the researchers found that air pollution caused an excess death rate of 154 per 100,000 in Germany (a reduction of 2.4 years in life expectancy), 136 in Italy (reduction in life expectancy of 1.9 years), 150 in Poland (reduction in life expectancy of 2.8 years), 98 in the UK (reduction in life expectancy of 1.5 years), and 105 in France (reduction in life expectancy of 1.6 years). Excess death rates were particularly high in eastern European countries, such as Bulgaria, Croatia, Romania and Ukraine, with over 200 each year per 100,000 of the population. Co-author, Professor Jos Lelieveld, of the Max-Plank Institute for Chemistry in Mainz and the Cyprus Institute Nicosia, Cyprus, said: "The high number of extra deaths caused by air pollution in Europe is explained by the combination of poor air quality and dense population, which leads to exposure that is among the highest in the world. Although air pollution in eastern Europe is not much worse than in western Europe, the number of excess deaths it caused was higher. We think this may be explained by more advanced health care in western Europe, where life expectancy is generally higher." As a result of these findings, the researchers say that national governments and international agencies must take urgent action to reduce air pollution, including re-evaluating legislation on air quality and lowering the EU's current limits on the annual average levels of air pollution to match the WHO guidelines. Professors Münzel and Lelieveld emphasise that, in terms of air pollution, PM2.5 particles are the main cause of respiratory and cardiovascular disease. Currently, the average annual limit for PM2.5 in the EU is 25 μg/m3 (micrograms per cubic metre) , which is 2.5 times higher than the WHO guideline of 10 μg/m3. Even at this level, several European countries regularly exceed the limit. Prof Münzel said: "The current limit of 25 μg/m3 should be adjusted downwards to the WHO guideline of 10 μg/m3. Many other countries, such as Canada, the USA and Australia use the WHO guideline; the EU is lagging a long way behind in this respect. Indeed, new evidence may lead to a further lowering of the WHO guideline in the near future. "The link between air pollution and cardiovascular disease, as well as respiratory diseases, is well established. It causes damage to the blood vessels through increased oxidative stress, which then leads to increases in blood pressure, diabetes, stroke, heart attacks and heart failure." Prof Lelieveld said: "Since most of the particulate matter and other air pollutants in Europe come from the burning of fossil fuels, we need to switch to other sources for generating energy urgently. When we use clean, renewable energy, we are not just fulfilling the Paris Agreement to mitigate the effects of climate change, we could also reduce air pollution-related death rates in Europe by up to 55%." According to Prof Lelieveld, the fine dust content in the air could be reduced further by limiting agricultural emissions, which are responsible for a comparatively large amount of particulate matter pollution and for the associated extra number of deaths in Europe. He said: "In Germany, for instance, agriculture contributes up to 45% of PM2.5 to the atmosphere. When manure and fertiliser are used on agricultural land, ammonia is released into the atmosphere, which reacts with sulphur and nitrogen oxides and associated sulphuric and nitric acids, forming salts such as ammonium sulphate and nitrate. These substances contribute significantly to the formation and composition of fine particles, interacting further with soot and organic aerosol compounds." Limitations of the study include the fact there is statistical uncertainty surrounding the estimates, so the size of the effect of air pollution on deaths could be larger or smaller. 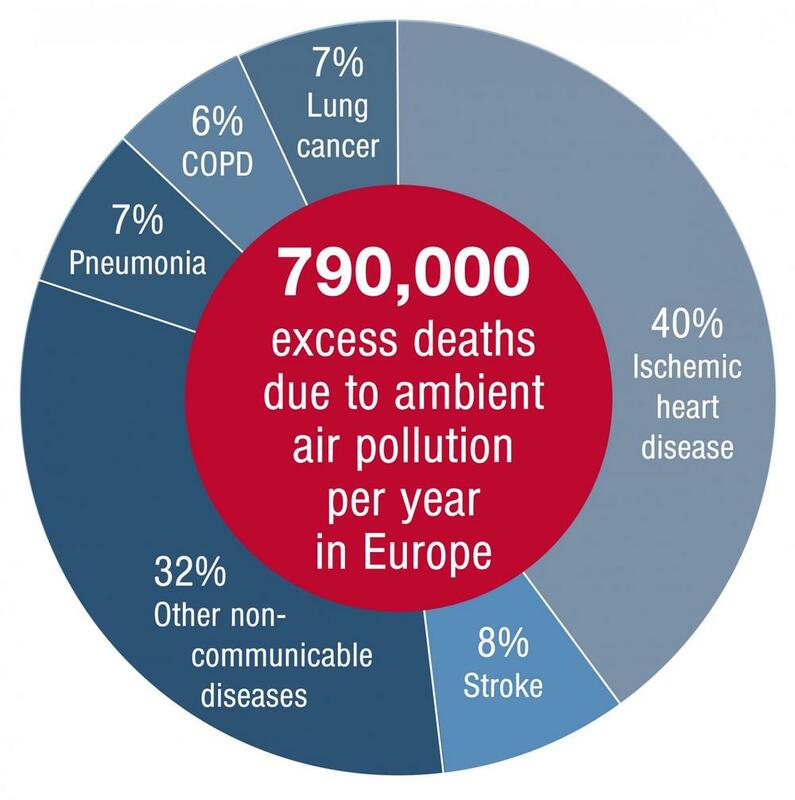 Pictured:Estimated excess mortality attributed to air pollution in Europe, and the contributing disease categories. At least 48 percent are due to cardiovascular disease (ischemic heart disease and stroke). A fraction of other non-communicable diseases should also be counted to cardiovascular diseases related mortality, with an upper limit of 32 percent. COPD, chronic obstructive pulmonary disease.